As if boxing weren’t already personal and emotional enough, we now have Oscar de la Hoya’s World Cup of Boxing. De La Hoya found the inspiration for this boxing team competition in golf’s Ryder Cup, where the best pro golfers of the US face the best of Europe. The format has brought out some of the finest moments of golf and at the same time magnified the frustrations of the sport as team and nationalistic pride get tossed into the competitive mix. Does this work for boxing? There is no question that it does as the second edition of this format brought out the competitive juices of boxers from Mexico and the Philippines at the Arco Arena in Sacramento, California. With flags and banners all around the venue, there was clearly national pride at stake. The Philippine team did not fail the US based Filipinos and those who went all the way from the country to Sacramento for the showdown. And they did not fail the millions who followed them back home. This was quite an RP squad. An excellent mix of youth and experience and the all-out support of the ALA Boxing and SGG boxing networks gave us arguably one of the best teams to represent the country in an international competition. It isn’t that easy to form a boxing team unlike perhaps a golf team in the Ryder Cup. There is no handicapping in the golf version simply because both sides present the best pro golfers and there always seems to be an able player ready to join the playing squads. There are no handicaps to deal with because Ryder Cup players are the best in the world. Boxing has the weight angle to deal with and it isn’t always that easy to come up with the best boxer in each weight category, given availability, experience and preparedness to fight. There’s also the matchmaking dimension, trying to work on experience, fighting hand as well as marketability and interest in a fight. The format seemed to work well for the Filipinos as the boxers came from basically the same camp and the same Visayan and Mindanao backgrounds. That could be the most critical ingredient in forming future teams for this competition. The Philippine team seemed to relish the format the most and the 5-1 winning edge personified that espirit de corps. The leadership of Freddie Roach, who clearly enjoyed being the head coach of the squad, was also instrumental as he did a masterful job of preparing each fighter with the assistance of the Filipino trainers and assistants. The Gerry Penalosa win was perhaps the most delightful. Behind through out the fight, Penalosa came up with a wicked shot to the body of Jhonny Gonzalez. Gonzalez froze in his tracks as if he had been hit from long distance, and then crumbled to the canvas in the seventh. Rey “Boom Boom” Bautista was obviously frustrated by having the only loss. However, the setback should not be a dampener to what was a remarkable performance by a Philippine team. Bautista just happened to be the last fighter on the card and ran smack into a Daniel Ponce de Leon who looked leaner and meaner than the last time when he nipped Gerry Penalosa. There was pressure, imposed by no one but by the circumstances of the event for Bautista to achieve three things: give the team a big finish, win a world title and keep an unbeaten record unblemished. A little too much undoubtedly, but the loss should be considered part of the formation of Bautista who has the talent and the heart to become a world champion soon. The loss could have been more devastating to the young man but the squad managed to embrace him with the solace of team spirit. Having stable mates, and many familiar faces around helped ease some of the sting of the setback. The World Cup is definitely a most welcome format for boxing. It is not that easy to organize and see through given that boxing is basically an individual sport. But let’s allow the format time to flourish and become a regular feature of the resurgence of the sweet science. Golden Boy and de la Hoya have done a remarkable job of infusing the sport with new ways of doing things while upholding the sport’s time-honored traditions. It should be interesting to find out whom the Philippines faces next when it defends the Cup and what kind of team we can come up with. WORLD CUP NOTES Former Ginebra player Dondon Ampalayo was in the World Cup audience at Arco Arena. Many of the Filipinos in attendance recognized the talented and wily forward who was quite a sensation during his pro playing years…the Aldeguer sisters, the dancing divas of the 70s were cheering for the Pinoys in every fight…Sacramento hit us as a quiet laid back town despite being the capital of California. It is nevertheless a history buff’s delight as there is a constant reminder from the past on every turn. A small town called Old Sacramento has been maintained with his 18th and 19th century look and feel to remind all about the Gold Rush, the Pony Express and the railroad history of the place..Filipino sportswriters at the World Cup had an impromptu session with Oscar de La Hoya after the press conference on August 9. My favorite question was by Salven Lagumbay – “when is Bob Arum going to return your Olympic gold medal? 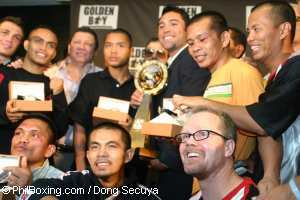 - that drew hearty laughs from all present and a big smile from de la Hoya. The Golden Boy answered that they were talking about it…Gerry Penalosa had a huge picture with his arms raised moments after stopping Jhonny Gonzalez in the Sunday edition of the Sacramento Bee, the city’s history-rich newspaper.